Dietary patterns better reflect eating habits as opposed to single dietary components. However, the use of dietary pattern analysis in nutritional epidemiology has been hampered by the complexity of interpreting and presenting multidimensional dietary data. Dietary data often consists of registrations of a range of different food items or products such as tomatos, beans, low fat milk etc. with a total of 30 to 80 food items. The aim of dietary pattern analysis is to extract certain patterns which constitue certain eating habits. This is most often done with no a priory information and solely based on the relational (correlation) structure within in the data. A natural choise is to use principal component analysis (PCA - for a detailed description click here), possibly with a simplicity-rotation, for estimation of patterns. The outcome form a PCA analysis is two sets of related sources of information, often refered to as factor scores and factor loadings. The factor loadings constitute the structure of the factor with respect to the food items and hence reflect which food items that are 1) responsible for the factor and 2) how these are correlated. The factor scores constitute a measure of how much the individual person has of this certain component. The factor scores can be used as a measure of intake in the same way as the original data, and hence be used for comparison with socio demographic information or certain helath related outcomes. The only difference between the factor score for say western diet and the food item say lowfat milk is that the scale of the factor score is arbitrary. The factor loading carry the information on the signature of dietary pattern and is therefor central in the translation of the factor into something meaningful. It and naming is the factor loadings that give rise to naming of the factor and to interpretation of an association between the factor score and certain outcomes. It is therefor of utmost importance, that the factor loadings are presented as clear as possible. Tabulation of factor loadings for more than 30 variables demands exhastive reading in order to capture all details. Visualization of factor loadings, does however, guide the eye towards what is important. 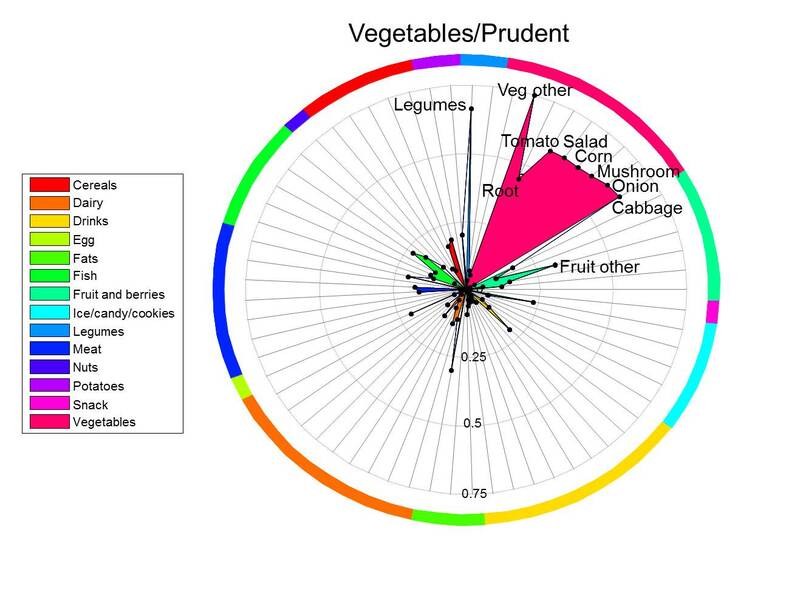 In this interface you can provide an .xls(x) file with information on the factor structure (names of food items, partition into groups of food items and factor correlation) which then will make a spiderplot. Download the following file and modify to fit your own results. The file spideplot.m can be used for the same purpose as the interface for those who have matlab locally on their machine.